Trilobites exist as fossils only today, having gone extinct at the end of the Permian period. Flickr user Trailmix.Net. Labels added by Debbie Hadley. Though they only remain as fossils, the marine creatures called trilobites filled the seas during the Paleozoic era. Today, these ancient arthropods are found in abundance in Cambrian rocks. The name trilobite comes from the Greek words tri meaning three, and lobita meaning lobed. The name refers to the three distinct longitudinal regions of the trilobite body. Trilobites belong to the phylum Arthropoda. 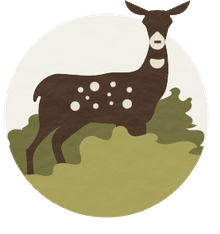 They share the characteristics of arthropods with other members of the phylum, including insects, arachnids, crustaceans, millipedes, centipedes, and horseshoe crabs. Within the phylum, the classification of arthropods is a subject of some debate. For the purpose of this article, I will follow the classification scheme published in the current edition of Borror and DeLong's Introduction to the Study of Insects, and place the trilobites in their own subphylum – the Trilobita. Although several thousand species of trilobites have been identified from the fossil record, most can be easily recognized as trilobites. Their bodies are somewhat ovoid in shape and slightly convex. The trilobite body is divided lengthwise into three regions: an axial lobe at the center, and a pleural lobe on each side of the axial lobe (see image above). Trilobites were the first arthropods to secrete hardened, calcite exoskeletons, which is why they've left behind such a rich inventory of fossils. Living trilobites had legs, but their legs were comprised of soft tissue, and so were only rarely preserved in fossil form. The few complete trilobite fossils found have revealed that trilobite appendages were often biramous, bearing both a leg for locomotion and a feathery gill, presumably for breathing. 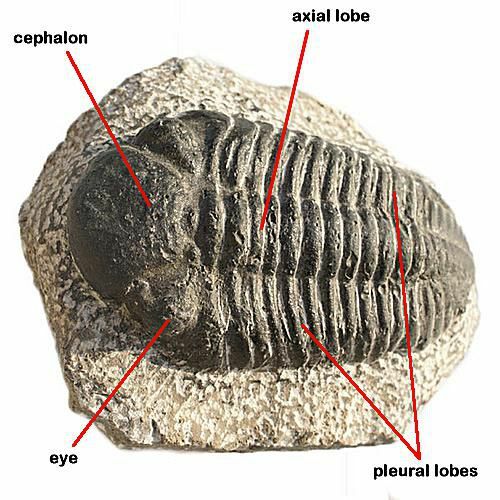 The head region of the trilobite is called the cephalon. A pair of antennae extended from the cephalon. Some trilobites were blind, but those with vision often had conspicuous, well-formed eyes. Strangely, trilobite eyes were made not of organic, soft tissue, but of inorganic calcite, just like the rest of the exoskeleton. Trilobites were the first organisms with compound eyes (though some sighted species had only simple eyes}. The lenses of each compound eye were formed from hexagonal calcite crystals, which allowed light to pass through. Facial sutures enabled the growing trilobite to break free from its exoskeleton during the molting process. The midsection of the trilobite body, just behind the cephalon, is called the thorax. These thoracic segments were articulated, enabling some trilobites to curl or roll up much like a modern-day pillbug. The trilobite likely used this ability to defend itself from predators. The hind or tail end of the trilobite is known as the pygidium. Depending on the species, the pygidium might consist of a single segment, or of many (perhaps 30 or more). Segments of the pygidium were fused, making the tail rigid. Since trilobites were marine creatures, their diet consisted of other marine life. Pelagic trilobites could swim, though probably not very fast, and likely fed on plankton. The larger pelagic trilobites may have preyed on crustaceans or other marine organisms they encountered. Most trilobites were bottom-dwellers, and probably scavenged dead and decaying matter from the sea floor. Some benthic trilobites probably disturbed the sediments so they could filter feed on edible particles. Fossil evidence shows some trilobites plowed through the sea floor, searching for prey. Trace fossils of trilobite tracks show these hunters were able to pursue and capture marine worms. Trilobites were among the earliest arthropods to inhabit the planet, based on fossil specimens dating back nearly 600 million years. They lived entirely during the Paleozoic era, but were most abundant during the first 100 million years of this era (in the Cambrian and Ordovician periods, specifically). Within a mere 270 million years, the trilobites were gone, having gradually declined and finally disappeared just as the Permian period drew to a close. Introduction to the Trilobita, University of California Museum of Paleontology. Accessed February 5, 2013. The Trilobites, University of Wisconsin-Madison Geology Museum. Accessed February 5, 2013. Trilobites, by John R. Meyer, Entomology Department, North Carolina State University. Accessed February 5, 2013. Is the Insect Nervous System Controlled by a Brain?